You got this one wrong Dog. I hope your readers will read the post for themselves and that they will recognize the selfless and humble tone of the author. 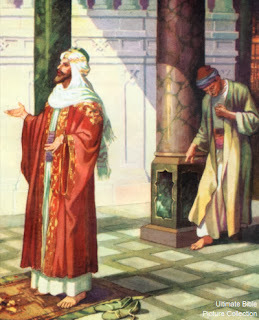 The Pharisee prayed "I thank you that I'm not like them" There is none of that here. This is not judgmental or condeming. Does the mere mention of bloggers strike a nerve with you? Perhaps you are a bit defensive? Perhaps you push it a bit too far at times and you know it? You have exposed much that is wrong in SBC circles and it was needed but you are barking up the wrong tree here brother. Wow, just wow....they can't take it can they....I write a blog and co-host a local 2 station radio show in which out show focuses on religion and politics. And we're pretty critical of the churches. ( we both were on church staffs in the past.) I wonder if we would be in a group not worth praying for? Traitors? Couldn't read past #2, praying for people (me) who think they poorly represent the Christian faith. I'm still blinking to make sure I read it right. Due to their own arrogance, they don't even know that they don't know. I am not a fan of the FBC, but I have to agree with Anonymous. We all have seen comments posted below a blog entry that injects criticism and anger into the discussion in a way that, in many cases, was never intended by the blogger. Often times Christians go against other Christians or against those that Jesus would have befriended. Critical blogging is not the issue. You're doing exactly the right thing, Watchdog, when you have a man like this call you out. And, then, to have FBC of Jax pick up on it! You and other wonderful bloggers have hit a nerve. Rather than responding to what is blogged about, they would rather throw the focus back on the blogger. So basically ANYONE......IN the church because WE are all quilty of (part 2) at some time or another to some degree or another since even Christ said our best is "filthy rags..."
and (part 1) those who have possible legal influence OVER and those who who are being driven "out" or "UNDER ground". 2) This is written in such a manner that you can almost see the original "brainstorm" notepad of bullent points "....people I dont like... And am tired of...." How do I say this but sound christiany....Hmmmm?" Personal agenda hidden in plain sight!!!!!!!! Daniel You are being called out! You opened assuming you speak for "...us all..." To gain default credibility! NONE given!!! Rewrite, addendum, or pull. Then grow or find a set to borrow and speak directly to those of us who have had enough. Thanks for recommend to read it anon... Now you go back and reread please. Proud to be able to say we are no longer part of the FBC Club paying for and turning a blind eye to these type of media stunts. Now all I needis a sticker for the cars bumper"...dont blame me I ...". 4. Highly critical bloggers and commentors. If you want to get a glimpse of the depravity of our fallen world, scroll down on a news article and read through the comments. Even many Christian blogs and news sites attract vile responses, some even by professing followers of Jesus. The Internet has opened the floodgates for trolls and for angry, self-justified people. But have you considered that perhaps those who communicate ungracefully may be doing it from a place of insecurity, brokeness or a deep hunger for what only God can provide? I don’t know what motivates the hostility all the time, but I do know that these are people God wants to rescue from themselves. If God could cause revival among the ruthless Ninevites, God could do a work among those who use the Internet for vile purposes. We should pray that God enraptures their soul with the good news of the gospel. We should pray that we don’t fall into their trap of bitterness and vulgarity. It is clear to me he's talking about all the garbage that he rightly labels "vile" on internet message boards and blogs written by messed up people out there. I wonder if you really believe his comments were aimed at critical Christian bloggers like yourself writing blogs which are civil but critical of much going on in the contemporary evangelical church. Either you're being dishonest in claiming that he's aiming at you and others like you, or you've become so cynical of the motives of the evangelical establishment that you see bad motivations in everything they do. Yes, I think he is referring to highly critical bloggers, as that is his description, not mine. Those who follow blogs like this one - blogs that are "highly critical" of some mega churches and mega church pastors, who stand up and call out abusive pastors and pastors who turn a blind-eye to abuse - we know that many SBC pastors believe these are vile, ungodly blogs. This has been documented on this blog for 6+ years, and other blogs. So yes, I think he was referring to "highly critical bloggers". But I will email him and ask him. He was definitely meaning " highly critical bloggers." Did just send him an email asking for clarification. If I do hear from him, I'll let you know. Or, if he is reading this blog, he is of course welcome to post directly here. I suggest all pastors have a suggestion box where the members can ask questions or put things right. It might take some time to get something done, however at least the paying audience have a means of bringing their concerns to the attn. of the church. You've done, and continue to do, some good work through this blog, but you go way too far sometimes. Your error, I believe, is that in your mind you've completely demonized the evangelical establishment in your mind and outlook. It seems to me that in your estimation, these people are not just misguided, they are EVIL. Yes, it troubles me deeply that Ergun Caner lied about his background, seemingly for his own self-promotion, and has not, at least publically, repented of it. But do I think Ergun Caner is the devil incarnate, an enemy of God? No, I don't. Like all of us, he's fallen. And like all of us, he doesn't like to admit his sin. But I digress. Yes, there is a lot of foolishness and false teaching going on out there. But that doesn't mean there is nothing good and God-ordained going on in evangelical megachurches or the Southern Baptist Convention. I would encourage you to try and moderate your perspective a bit. This is off topic but I didn't know how else to get this message to you. It seems that Arlington Baptist College and Ergun Caner took out a criminal complaint against James White and two others (including the Pastor) of the church where White gave his remarks about Caner's lies. Here is the link if you want to see it. Katie - I am looking into it right now. Thanks for the tip! If the complaint is false and can be understood to have been filed for the purpose of harassment, that is a crime in Texas! "You error, I believe is that in your mind you've completely demonized the evangelical establishment in your mind and outlook." Well, this pretty much sums it up for me...The truth is hard to face but when people do, there comes a freedom that you've never known. "It seems to me that in your estimation, these people are not just misguided, they are EVIL. Yes, it troubles me deeply that "Ergun Caner lied about his background, seemingly for his own self-promotion, and has not, at least publically, repented of it. But do I think Ergun Caner is the devil incarnate, an enemy of God? No, I don't. Like all of us, he's fallen. And like all of us, he doesn't like to admit his sin. But I digress." "It seems that Arlington Baptist College and Ergun Caner took out a criminal complaint against James White and two others (including the Pastor) of the church where White gave his remarks about Caner's lies." You don't consider that evil? I guess the first poster in this thread did not know the author of this blog was stalked and harassed by these humble, loving Christian leaders he dared to critique. http://fbcjaxwatchdog.blogspot.com/2009/04/story-of-watchdog-blog-part-1.html They called him crazy "obsessive-compulsive" in the mainstream media and used their ties to the local police force and State Attorney General's Office to try to take down his blog. People who bash freedom of speech and press and those who are willing to risk themselves to expose corruption, are TRULY barking up the wrong tree. The following is a great parody of all these poor, "humble" people referenced by the first poster. No wonder people quit going to church. The holy Joe's at work. Anonymous 1:43 here. As to the Ergun Caner/James White "criminal complaint" issue, I'd like more facts. All I've heard is White's saying that they filed a complaint. Not saying he's lying, but he did not, that I heard, say what specifically Caner and/or the college reported to the police. Where is the police report? It should be obtainable through FOIA. It should state what was specifically reported and what the results of the police investigation were. If it is true that Caner and/or the college filed a false and/or frivolous report, then why aren't the authorities pursuing charges against him/them of filing a false police report? Why isn't White suing Caner (I have a hard time believing that White thinks Caner is a "believer" he's scripturally prohibited from suing). Again, I'd like more facts. I remember months ago at Prestonwood some guy who'd gotten on the bad side of the leadership was reported to the police and it first came out that it was nothing but harassment and intimidation by the church. Turns out he had posted something online about a certain church staff member as being "his target." Possibly overreaction, but not frivolous or false. As a critical blogger please pray for me. I'll take all of the prayers I can get. I am the original anonymous poster on this thread. I see several people have commented on my remarks. Anon 11/16 7:35 I'm sorry but I really don't follow your train of thought but I am amazed at your apparent ability to perceive the motivation and know the hearts of others. If we are honest with ourselves we'd admit that we don't fully know our own motivation so how can you "almost see the brainstorm bullet points"? To Anon 11/18 12:08 that is quite a blanket statement you made there when you wrote "anybody in "ministry" is far from humble." You also seem to have the ability to judge the heart and intentions of others, amazing! I understand many have been hurt and abused by bad leaders in the SBC and beyond but that doesn't prove they are all the same. Anon 11/19 1:30 I do know the history of the Watchdog. Are you suggesting that all SBC leaders, authors, etc must be controlling and manipulative just like those at FBC Jax? Have they lost all benefit of the doubt simply by being associated with the SBC? The section about bloggers and comments did focus mostly on the comments but I did see it as a call to pray for the bloggers as well as the commentors and rightfully so. This is only my perception but some bloggers seem to have thrown objectivity out the window and don't seem to give much benefit of the doubt anymore. I believe there are many reasonable believers who are not "kool aid drinkers" yet share that same perception. I don't know about you but I don't naturally like people who seem to intentionally misrepresent situations. This piece acknowledges those feelings but challenges me to pray for those people regardless. You can call that self righteous but I see it as humble and selfless. There is no arrogance or superiority in that statement. Of course, those who are guilty may get defensive. Isn't that how we usually react when our sin is exposed? I know I do. I think the Dog goes too far at times. The tone and spirit of the site does not seem to be intended to build up the body of Christ. Are there legitimate concerns? Of course but as Christians we are called to lead with LOVE. I stand behind my statement that you got this one wrong Dog. Anon - thanks for sharing your view. I did send a short email to Dan Darling asking for clarification, but to date have not received a response. I think we are dealing with 2 different questions here and we need to do a bit of "exegesis" as it were. 1. What did the author intend when he wrote it? 2. What did FBC Jax intend when they posted it? Considering the history with Tom and FBC Jax I can understand the concern. I just think you should leave the author out of it. FBC Jax may have simply "picked up" his story for their own reasons. The comments about bloggers are actually minor when considering the scope of the article but very well may have been the main reason they decided to share it. Only God knows for sure. Either way, it's a minor offense. You could have absorbed this one Tom. You really need to do something about that root of bitterness, for your own sake. And I'll add that unless you've seen what I have seen and what others have experienced that dare publicly question and criticize religious men and their institutions, and have seen first hand what pious religious men and women - both lay and professional - are capable of doing to you and lying about you - you won't understand my view on Dan's article. To publicly and sometimes harshly criticize a "man of God" is about the worst thing that a Christian can do these days. I can assure you, no root of bitterness to be removed...but perhaps you need to get that plank removed out of your eye. "I'm sorry but I really don't follow your train of thought but I am amazed at your apparent ability to perceive the motivation and know the hearts of others." "The tone and spirit of the site does not seem to be intended to build up the body of Christ." Sounds like you are judging WD's motivations here, but that would be hypocritical considering your first statement. Please explain. "It seems to me that in your estimation, these people are not just misguided, they are EVIL. Yes, it troubles me deeply that Ergun Caner lied about his background, seemingly for his own self-promotion, and has not, at least publically, repented of it." You seem to say here that fabricating a fictitious background and expounding it from the pulpit for a decade is common place. And that the usual response to being found out is anger, denial, and attacking those who dare to tell the truth about you. Is that really what happened here? Glad to hear there is no root of bitterness Tom. You and I have corresponded offline a few times and I have experienced similar issues with a SBC megachurch but not to the same extent as you. For example my own Pastor has me blocked on Twitter and no one from the church has ever reached out to me as to why. If I am out of line and need correction you'd think they would shepherd me. But no. Of course I can't get close enough to him to ask. I have sent emails and received no response. I am left to assume that they don't won't talk to me because I will ask questions they cannot answer. I know I struggle with bitterness towards the MOG and I may have assumed you do too but I don't think I was acting as a Pharisee. I am trying to forgive for my own sake. We are still at that church because it's complicated but we are pulling away slowly. So, I am not without experience in this area but I don't react to that experience by making blanket statements about all clergy or SBC as some of your posters have. I still think we are called to rise up and absorb it when people sin against us where we can. Our tolerance levels differ based on our experiences and our spiritual condition but our ultimate goal should always be to represent Christ well as much as it depends on us. I said "seem" and I thought this was clear enough to imply my own fallibility. Please note, I was not judging motivation, I was sharing my perception. I think there's a difference. "I was not judging motivation, I was sharing my perception. I think there's a difference." I believe that's what WD was doing as well. "You seem to say here that fabricating a fictitious background and expounding it from the pulpit for a decade is common place. Based or acting on error; misled"
I don't think I said anything which could reasonably be interpreted as an assertion that Caner's specific conduct is "commonplace." However, what is indeed very commonplace, indeed universal, is the tendency of sinful man to refuse to admit sin, even to himself/herself, and to often be very aggressive in doing anything and everything possible to avoid being found out. So in this regard, yes, what Caner has done and is doing is universally "commonplace." (see generally the story of Adam and Eve). Statements like "anybody in ministry is far from humble" and "personal agenda hidden in plain sight" go well beyond perception. These are conclusive statements that communicate a certainty about the intention of those in question. Anon Nov 19 1:04 PM Yes, I have the God given ability to "judge" others by their actions and what comes out of their mouths. People who believe like you try to silence the truth for whatever your agenda is. "These are conclusive statements that communicate a certainty about those in question" Yep, and I'm certain I'm seeing things correctly. Well I believe that is exactly the type of judgement Jesus warned against. "well I believe that is exactly the type of judgement that Jesus warned against." Well, that's your choice to believe that. Paul asked for prayers in being bold in his chains and good at communicating the Gospel. Don't forget Tom, its not always about admonishing. "I don't think I said anything which could reasonably be interpreted as an assertion that Caner's specific conduct is "commonplace." However, what is indeed very commonplace, indeed universal, is the tendency of sinful man to refuse to admit sin, even to himself/herself, and to often be very aggressive in doing anything and everything possible to avoid being found out. So in this regard, yes, what Caner has done and is doing is universally "commonplace." (see generally the story of Adam and Eve)." In the span of 3 sentences you go from denying that you stated his actions are commonplace to stating that his actions are indeed commonplace. Which is it? "often be very aggressive in doing anything and everything possible to avoid being found out." It's too late for that my friend. "see generally the story of Adam and Eve"
Didn't God call their actions evil in that case? Reasoning and reading comprehension deficiency detected. I said that his specific actions, i.e.,lying about being a former jihadist and creating a false testimony for personal gain, are not common, but that being defensive about sin is universally commonplace. If you need further clarification, don't hesitate to ask. My point is, yes indeed, what he's doing that people have condemned him for is "commonplace." Absolutely what Adam and Eve did was evil. That's the point - we are ALL evil. We have to constantly remind ourselves of that lest we start thinking we occupy some moral high ground. Jesus is the only legitimate moral high ground, for anyone. It is right to call out sinful behavior, but I don't see a spirit of love and gentleness on this blog. Dare I say that I see a lot of hate? To the blogger and most of the commenters, these people are not just sinners. No, they are Satan in disguise. They must be crushed. "I don't see the spirit of love and gentleness on this blog" So then what you are saying is that Jesus was wrong in the way he dealt with the Pharisees and false prophets? "Dare I say that I see a lot of hate?" This is just one of the areas that you lack discernment and don't have a clear understanding of things. "Reasoning and reading comprehension deficiency detected." "If you need further clarification, don't hesitate to ask." Arrogance and a massive ego detected. Yes, being defensive and not wanting to admit a mistake is commonplace, isn't it? "Absolutely what Adam and Eve did was evil. That's the point - we are ALL evil." This seems to contradict your earlier comment. Please explain. "It seems to me that in your estimation, these people are not just misguided, they are EVIL." "Dare I say that I see a lot of hate?" Didn't you condemn judging motivations earlier in your comments? So how were you able to come to the conclusion that these unidentified comments were inspired by hate without judging the motivation? That type of charge is generally issued as an intimidation tactic to try to censor dissent. "To the blogger and most of the commenters, these people are not just sinners. No, they are Satan in disguise. They must be crushed." How did you come to that conclusion? Where is that stated specifically or are you judging motivations again? COOL that there is a lot of discussion however I personally am "lost in the weeds" trying to follow it. May I attempt to bring it back around to the original points? 1) It was written w an unclear intent. Those who havent experienced mega church drama probably read humbleness/love simply cause they cant imagine it could be otherwise while those who have are perceptive as to it and read more carefully. 2) It really is generic dribble like soooo much of the stuff written/spoken today that passes for educated speech/thought. AND that adds to the unclear intent. Could have been said... We are all sinners. We all have people we dont like. Get over it and pray for them cause some people dont like you either! 3) FBC picked it up and ran with it even though those of us who have sat under Mac Believe he is WAY more educated than to think highly of this piece...at least w/o some clarification of his own. So why run it...intent? Ill finish w this. I Think we as christians should live to be as crystal clear as possible which sometimes makes for a difficult life IE Guarding and Clarifying our speech, doing without stuff/vacations/toys, doing the ministry stuff no one else wants to, etc. But "lay up your treasures in heaven...". The writer has been called upon to Clarify the intent... And as long as he does not (which should have been done in the piece) he... I Think...is wrong and I Think...in sin. Wow, talk about blatant commonplace general accusations and conclusions. How about this gem: "That's the point - we are ALL evil." Ouch. That's bad, bad news. WE are ALL E-V-I-L! I can't help but wonder if we discard that one single notion, do we need religion at all?